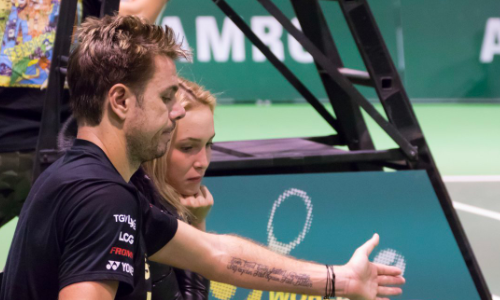 Just a couple of days after featuring in the Fed Cup, Croatian tennis player Donna Vekic jetted off from to London to Rotterdam to support her boyfriend Stan Wawrinka. Wawrinka, a three-time Grand Slam champion, is scheduled to participate at this week’s ATP 500 Rotterdam Open. And in a photo published online, he had his lady love by his side during a practice session on Sunday. Meanwhile, Wawrinka, who was upset in the first round by Marius Copil at Sofia Open last week, has a tough first round opponent in Benoit Paire of France. Should he win, he will lock horns with either 4th seed Milos Raonic or Philipp Kohlschreiber for a place in the quarter-finals.